Prepare the Rye sour by adding a tablespoon and a half of your active rye starter to the 250g water, and mix well to disperse. Add the Whole rye flour, mix well, and let stand for 8-12 hours at room temperature until the surface just starts to crack and collapse. To prepare the soaker, weigh all soaker ingredients into a bowl, and then weigh 160 grm of water, boil it, and add it to the soaker. Mix well, cover, and let stand until overnight, or when your rye sour is ready. Next day, mix all ingredients at once, by hand or using a mixer for 5-10 minutes. 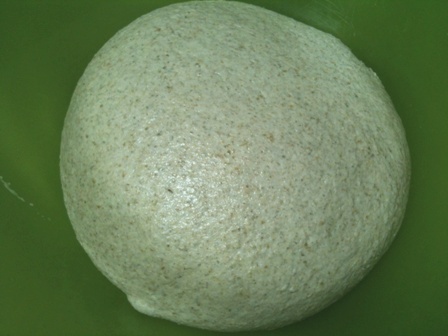 The dough will remain relatively sticky, so try to resist adding any flour at this stage.Shape as a round and let ferment in an oiled bowl for 2 hours at preferably 78 F or 24-25C, folding it half way through at the 1 hour mark. 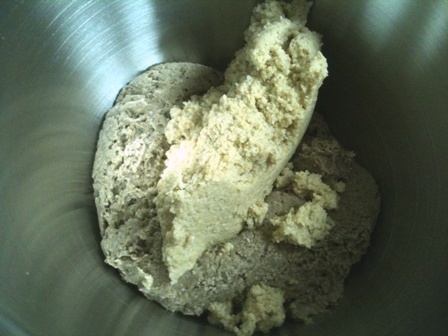 By the end of bulk fermentation, the dough will have risen by 50-60%. scrape your dough onto a heavily floured surface, pat the dough even (Don't knead), divide into the desired dough pieces, and round each piece leaving them to rest for 15- 20 min, covered. Dust your basket with a mixture of all purpose flour and rice flour, and shape your dough and invert it smooth side down into the basket. The final fermentation will be only 45 minutes, but watch the dough NOT the clock. Preheat your oven at this stage with a stone in place to a 500F or 260C. 5 minutes before loading the bread, place your steaming dish filled with wet towels on the bottom of your oven. When ready, invert the dough on baking paper lined peel/ board and close the oven immediately. Bake for 15 minutes with steam, and then remove the steaming dish and reduce the temperature to 400F for another 20-25 minutes. When the time is over, remove your bread from the oven. Wear oven mitts, and tap on the bottom of one loaf, It should sound hollow. Furthermore, you may insert a thermal probe into the center of the loaf from the bottom, and the temperature should register 195-200F or 90-95C. If it doesn't, put it back in the oven for another 10 minutes. Cool the bread completely on a wire rack, prior to cutting. Due to the soaker, the aroma of this bread is really attractive. When cool, The crust was somewhat chewy, and the crumb slightly moist but not chewy. 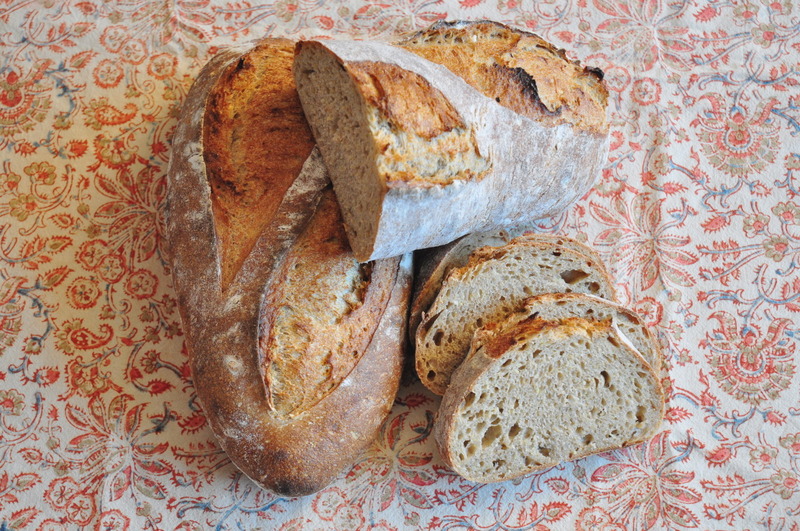 The flavor of this bread is earthy sweet and very pleasant. The crumb is close textured and compact due to all the whole grains, the bread might have benefited from extra lightness by increasing bread/all purpose flour. I have eaten this bread thinly sliced with a spread of cheese, and it was fabulous. This bread keeps really well. I'm always impressed with how expert bakers like you and Ian and dbm can scan your pantry and conjure up a formula that bakes out at nicely as this one did for you. Sign of an expert. I'll bet the flavor disappointment you described with one of your recent bakes doesn't apply here! Corn, rye, spelt, semolina...man, this must taste great. Plus superb shaping and dramatic bloom (Floyd -- headline material here, no?). 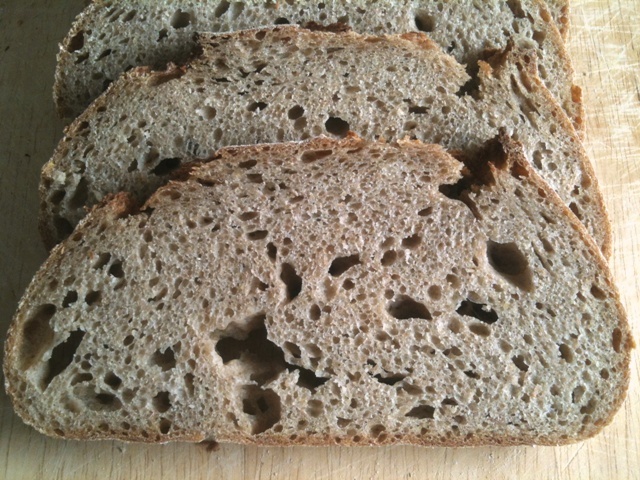 Great crumb for a bread with 50% gluten-challenged flours. 31% prefermented flour (incl. rye & spelt) kinda shortens the proof -- no waiting till midnight for the bread to come out! Nice baking Khalid, and two thumbs up for your documentation as well - great photos and easy on the eyes [and brain] spreadsheet. Thanks for sharing. Indeed, this one is a beauty! Indeed, this one is a beauty! Would you mind if I featured it on the homepage for a bit, Khalid? That is a very generous praise, Tom! Thanks. Now, any bread with a good rye sour and a soaker that contains corn and semolina just has to taste great. This bread is assertively Rye, and should be cut and consumed as one. 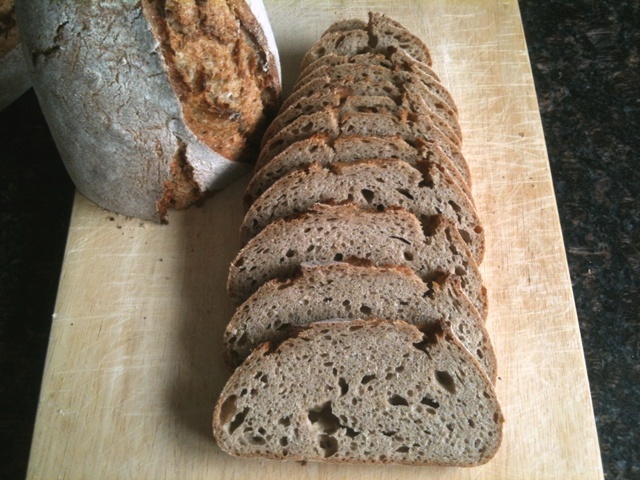 The spelt also adds to the darkness and denseness of the bread, so you may consider this as a 50% rye-like bread. I like the simple recipe layout of Hamelman, it is easier to discern than others i've come across. Many thanks for your encouragement, Tom! ears on these batards are decent enough to be called fabulous. This is the kind of healthy bread you can eat every day and never get tired of it. It has to taste as good as it looks inside and out. Very nice baking Khalid. It's good to get you back on track taste wise. I'm thinking if you, Ian and I had a baking club, we would have to let Toady Tom in not just because he is a good bread baker but also because he has a good eye and is so nice! 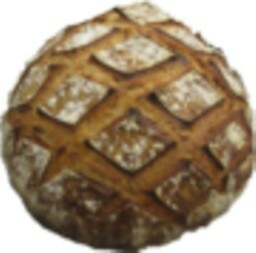 We like this bread a lot! Much thanks to you DA! The useage of soaker has been a revelation to me, it salvages any flavor flaws you might end up with. You are absolutely wise in adding soakers to your wholegrain breads, as they tend to balance out the sourness from the starter with their sweetness. 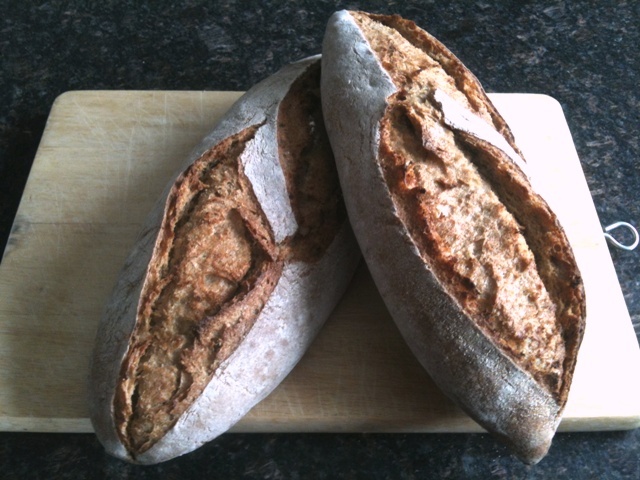 You'd have to be a well established baker to perfect a sourdough wholegrain recipe that does not contain a soaker. Yes Varda, complex, and rather sweetish. Nice combination of flours and flavors. i love your scoring and your crust. i do have a few questions....how long and at what temperature was the water in the soaker? I'm surprised you only needed a 45 minute rest after shaping. How hot was your resting area? It was a cold soaker (room temperature) for 10 hours. As to the rest, no, the final fermentation took 45 minutes. My kitchen ambient tempertaure is 25C. What beautiful loaves! I am surprised by how quickly you dough fermented! Must have been the rye sour. I know when I use fresh rye things happen very quickly! Thanks for the post and your photos. Yes, it lasted only 45 minutes as the bulk fermentation was long enough (2 hours). Yes, this is the kind of bread suitable for me and my wife .. not for children. If your perfectly shaped and scored batard has any competition, it is between its own crust and crumb! That's a very nice formula and wonderful looking loaves, Khalid! I'm sure they taste just as good as they look, and the soaker ought to keep them fresh for days. As the rest, I'm also surprised how quick the final fermentation was. Did you notice that the dough was pretty well developed as you shaped them? With such a short final proof, you might be able to mix, ferment and bake it during a single evening session mid-week as well? Lovely bread, Khalid! Yeah, the dough was perfectly developed and ready for a short final proofing, as two hours bulk fermentation were more than necessary. True, this recipe can be baked during the weekdays. Always a pleasure to hear from you, Hans! Thanks, David! your encouragement is always most appreciated. Like you, i have limited access to speciality flours like rye and spelt, as no store here carries them, save ofcourse spinneyes. Look around, you might end up with a speciality mill, or a store that carries them. Khalid. Nice rye! I love rye's like this one. Very nice crust as well. The bloom you got on the scoring must have been a pleasant surprise! I only hope for my loaves to turn out like that. Good job and happy eating! They were underproofed, so they burst open. I end up with such blooms only when i use two stones, one above the loaf, and one under it, both are preheated for an hour. Good steaming ( i use sylvia's steaming technique), and good scoring ( i learned from David (dmsnyder) , all contribute to the effect you see above. Oh and slightly underproofing also helps. omg neat scoring! Looks great! How do you achieve such a pattern? Use the search box at the top left to look for " scoring tutorial" by TFL member dmsnyder (David). David's scoring tutorial can be found here. Why don't you try and bake one? The soaker combination was a hit. Beautiful rye and spelt loaves! I'm consistently being able to score successfuly, thanks to the set of conditions i learned here. In my oven, an additional stone above the loaf helps alot too. Your batards are stunning! I had to share how visually I was drawn to them as soon as I saw them! You captured them perfectly. Thanks, Casey! I'm glad you liked the photos. I made this recipe today and it worked out really nicely. Delicious! Thanks, M hart! Glad you liked it. I have to try this recipe once more. Looks like a fine loaf of bread, m_hart! Maybe adding a couple of tbl. Maybe adding a couple of tbl. spoons of good olive oil will fix the texture of the crust. I would love to bake this bread, but the list of ingredients and quantities are not followed up with instructions. Would it be possible to post the instructions? Thanks! I apologize for not including the required amount of rye starter. I just changed the recipe, and instructions. Thanks for noticing this. I hope you try it soon! The link doesn't work. However, i don't see why mixing of rye sour with water will lead to overfermentation. What was the temperature of the water that you mixed the dough with? I can't judge on the results with seeing a picture of the sliced bread. p.s. another question....if you could add anything else to the soaker, what would it be? Double thanks! i haven't used amarnath in my baking, sorry. Semolina is from durum wheat, and may be coarsely ground Kamut (which somewhat resembles Durum wheat) can be used instead. But, Kamut is hard to come by and is expensive, so it isn't a suitable replacement! Looking at the comment below, i think that couscous (which is essentially pre-steamed semolina) would worked well , if you can find it. If i would add anything to the soaker it would be a tablespoon of barley malt extract (sweet malt syrup).